Scientists at the University of Bath have levitated particles using sound in an experiment which could have applications in so-called “soft robotics”. 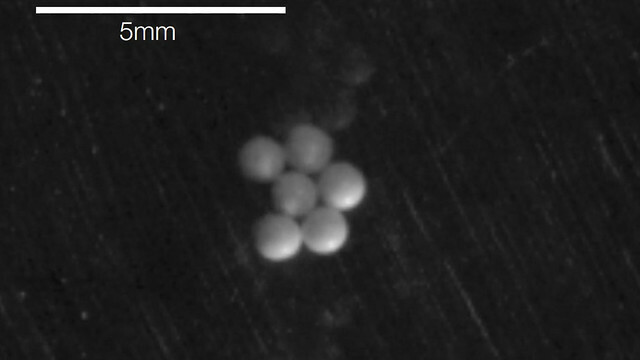 Scientists at the University of Bath have levitated particles using sound in an experiment which could have applications in so-called “soft robotics” and help reveal how planets start to form. The research team, from the University of Bath and the University of Chicago, were interested in how materials cluster together when they’re not on a hard flat surface. The team discovered that by changing the sound-wave frequency, they could manipulate the clusters and influence the emergent shape. They found that rearranging the shapes often depends on one particle acting as a “hinge” and swinging around the others to reconfigure, which could be very useful in a range of potential applications. Dr Anton Souslov from the University of Bath Department of Physics said: “Six particles is the minimum needed to change between different shapes, which is where things get interesting. “We’ve found that by changing the ultrasound frequency, we can make the particle clusters move about and rearrange. This opens up new possibilities for manipulating objects to form complex structures. Maybe these hinges that we observe could be used to develop new products and tools in the fields of wearable technology or soft robotics – where scientists and engineers use soft, manipulable materials to create robots with more flexibility and adaptability than those made from rigid materials.